Mission Statement: The mission of Endeavor House is to provide a decent sober living space for five men returning to our community from incarceration, who are ready to undergo life changes. Goals: To maintain safe, sober, and affordable transitional housing for men working toward independent living. To encourage and assist residents to becomes and remain financially self-sufficient. Endeavor House officially opened on February 1st, 2018 for our first cohort of residents. 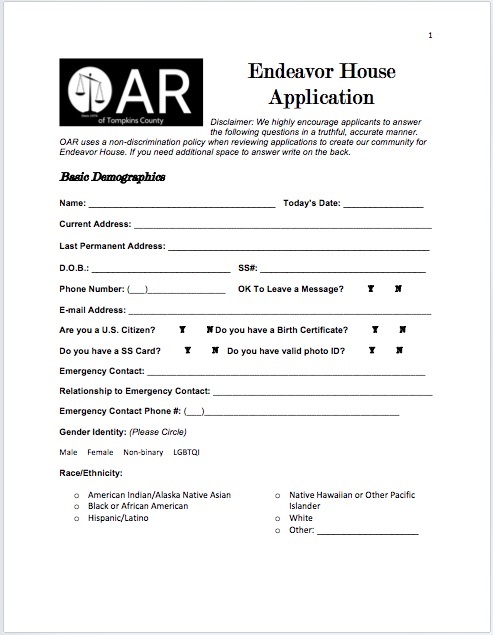 We are always accepting applications. Please keep in mind there is a waiting list, and preference is given to residents of Tompkins County.